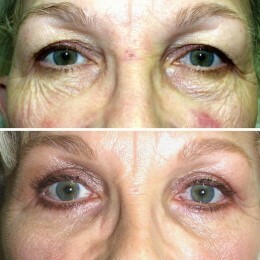 Eyelid Surgery Vs Browlift: What’s it all about? One of the most common points of confusion in cosmetic facial surgery is understanding the diagnosis and treatment options between eyelid surgery and brow and forehead lift surgery. Put plain and simple, the brow and forehead are intimately related to the eyelids in youth and aging. If you look at your picture in your 40’s or 50’s and compare them to your high school picture, the chances are that your brow has drooped, your forehead has wrinkled and your eyelids have excessive skin, muscle and fat. Although cosmetic eyelid surgery is one of the most popular procedures worldwide, many times people have skin removed from their upper eyelids when in fact they should have a brow and forehead lift. The problem with misdiagnosing the need for browlift surgery is that if a patient has excessive skin removed from his or her eyelids then it may be impossible in the future to have a brow lift as there will not be enough skin left to close the eye. Likewise, even if conservative skin removal is performed and then repeated later a brow lift may be impossible. 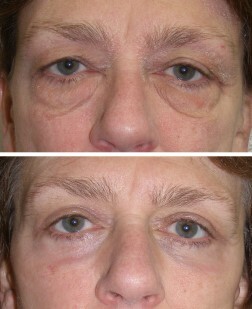 Finally, if a patient already has low brows and more skin is removed, the brow can be lowered even more. So, what do you do? Basically, when you seek a consult for upper eyelid rejuvenation, if the doctor does not mention the word “brow” in the first several sentences, you should seek another opinion. This is because many surgeons do not understand the extreme importance of upper facial aesthetics. In female patients, the brow normally sits above the upper bony rim of the eye socket (superior orbital rim). If you ( as a female) reach up and feel your brow and it sits at or below the rim, you may be a candidate for a brow lift. In males, the brow usually sits at the orbital rim. Not every patient is a candidate for brow and forehead lifting, but many patients are. If you look in a mirror and relax your brow and forehead and they gently elevate your brow on the middle and lateral portions regions you can see a preview of what a brow and forehead lift may do. In the average patient a brow lift of 5-8 millimeters (less than ½ inch) will produce a more youthful, alert, awake and open eyed look. When I manually elevate a patient’s brow they either love it and say “that is how I used to look years ago” or they feel that it is excessive or unnatural. Obviously, browlift is not an option unless one likes the look. In my experience about 60% of patients like the look and the other 40% don’t like the look. There is no doubt that an excessively elevated brow looks very fake, so conservative surgery is imperative for a natural look. For those that do like the elevate brow appearance, they will notice that it elevates the most lateral (side) region of the brow. As this area gets saggy, it causes a “sad puppy” appearance which doctors call lateral hooding. Elevating this hooding makes most patients look younger. You will also notice when you elevate the brow that the excess eyelid skin significantly improves. This is because elevating the brow lifts the saggy tissues and fat and repositions them to a more youthful position. Many times, patients present to the office asking for blepharoplasty (cosmetic eyelid surgery) and after education them, they opt for brow and forehead lift which corrects the upper eyelid aging as well as the sagging brow and forehead. Patients with significant excess skin or fat may need eyelid surgery and browlift at the same time. Another benefit of brow and forehead lift surgery is the ability to improve forehead wrinkles by tightening the forehead skin. Obviously, not all patients need brow and forehead lift as many patients do not want or need their brows elevated. 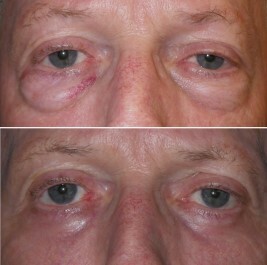 In these patients, removal of skin, muscle and fat on the upper eyelids is all that is necessary. A brow lift is a more comprehensive procedure and is a bigger surgery with a longer recovery when compared to blepharoplasty. When I perform blepharoplasty I don’t use scissors or scalpels, but rather high tech devices such as CO2 laser and radiowave surgery. These modalities prohibit bleeding and blood loss is several drops. Less bleeding means, less bruising, less swelling, less pain and faster healing. 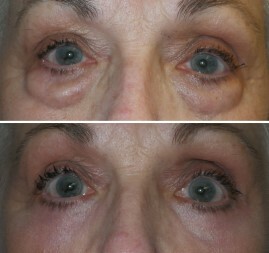 Normally surgery on all four eyelids take about an hour and is usually performed with light sedation. The recovery is generally one week, although most patients are up and around in less time. Most old fashioned brow lifts were performed by a very aggressive incision at the top of the head to reflect the entire front scalp during the procedure (coronal brow lift). Contemporary brow and forehead lift is frequently performed with endoscopic surgery through small, button hole incisions hidden in the hairline. Another very popular contemporary method of brow and forehead lift is the mini open brow technique. In this technique, a small incision is made just behind the hairline in a very specialized manner to allow the hair to regrow through the scar, making it extremely cosmetic. One big advantage of the mini open procedure is that it does not raise the hairline. All other brow lift procedures will raise the hairline to some extent. This is not a problem for patients with low hairlines, but many females already have elevated hairlines and would not look good with an even higher hairline. There are pluses and minuses of both of these procedures and each patient is different. A competent surgeon will offer multiple means of performing brow and forehead lift to tailor a custom procedure for that specific patient. The take home message here is that if you think you need your upper eyelids improved, success may lie in eyelid tuck, brow and forehead lift or both. If your surgeon does not offer both options or discuss the importance of either, a second opinion may be in order.